As much as I can enjoy making a nice big meal from scratch ( like tomorrow's roast , potatoes & veggies ) occasionally .....I need a break . That's when I check out the prepared foods section ( NO .....NOT FROZEN DINNERS ) of the market . They have all sorts of ready-to-heat up meats & sides .....everything from steak tips and turkey breast to mashed potatoes and mac&cheese . It's really easy to get a nice meal on the table, IN NO TIME, using some of these products . I particularly like ( and often use ) cooked chicken strips . 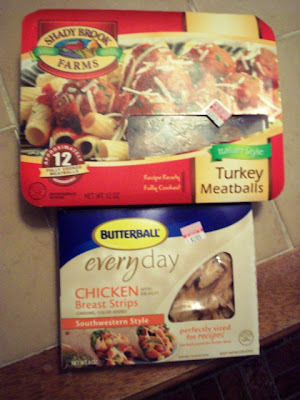 This week I bought 3 packs ( 6oz.each ) of BUTTERBALL " EVERYDAY " CHICKEN STRIPS ( regularly $ 2.89 a pack ....this week on sale at STOP&SHOP ....for $ 1.99 each ....WOW !!! ) . I bought the SOUTHWESTERN STYLE because I wanted them for my " chicken fajitas " . You can use these right out of the package to put in a sandwich or top a salad ( ummmm ..chicken Caesar salad ) or you can heat them up ( like I did ) to make your favorite Mexican ( or any style ) hot meals . They were very tasty , extremely easy to use and very inexpensive ..... and my fajitas were .......WICKED GOOD !!!! ( Sorry .....Mass. joke ) . LOL So I HIGHLY recommend these for a great way to get dinner on the table ....fassssssst . I also bought 2 packages of SHADY BROOKS FARMS " ITALIAN STYLE " TURKEY MEATBALLS . They also come in " Italian style " beef meatballs .....and were on sale at STOP & SHOP for $ 2.99 each ( regularly $ 3.59 each ) . I buy these often .Since they're fully cooked ..... not only do they heat up moist & tender and very tasty .....you just have to plop them in your favorite sauce for about 20 min......and VOILA ! Now you've got meatballs to top your favorite pasta ( I put mine over rigatoni last night... yum ) or to put in some nice sub rolls for sammies ( stick some peppers and onions in there too ) or don't sauce them at all and use them another way ....like over buttered noodles or sliced up for lasagna . WHATEVER !!!! Anyway you use them they are umm umm good .....and easy . And that's what we like . So try them both ....you won't be sorry . But what are you going to do with all that extra time on your hands ???? ?